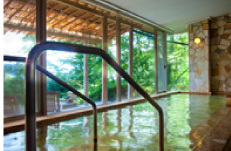 Hanaougi is Japanese-Style Luxury Hotel in Gora. 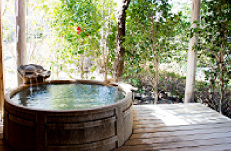 We offer you the the time of peaceful and relaxing moment with seasonal view and cuisine. 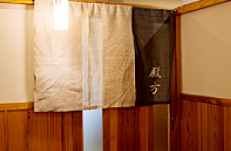 The corridor is all decorated by Straw Mat called TATAMI. 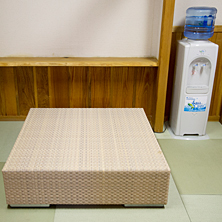 Staying with us must be one of the most elegant experiences in Japanese Custom. At the soaring lobby, there are 3 chandeliers made by wood.  Also, there is an IRORI Fire Place made by JINDAI-KEYAKI that is the tree was under the volcanic ash for 2600 year at Akita Prefecture. 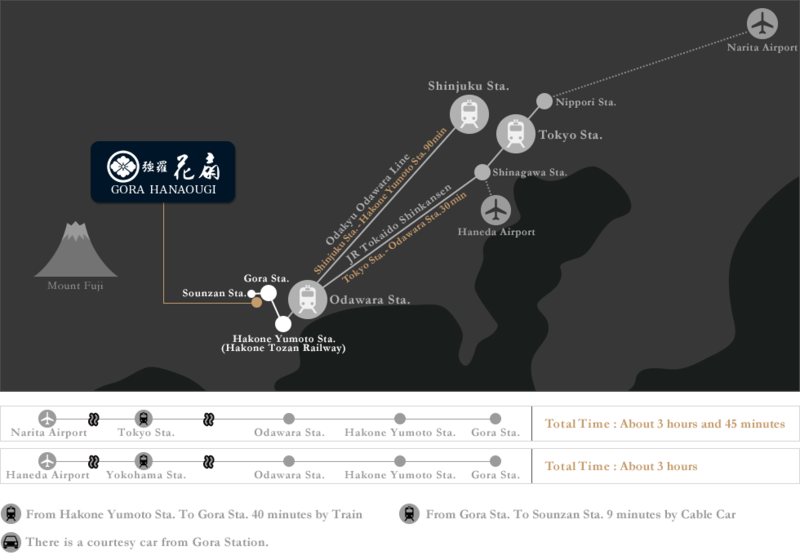 Hope you experience our special and unique OMOTENASHI that have come out of Hida. 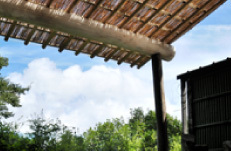 All of the rooms are including private open-air bath that has a superb view of GAIRIN Mountain and Forrest. Hope you enjoy staying with us with quiet and peaceful moment. 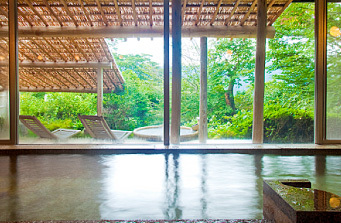 This is the most spacious room in Gora Hanaougi, designed and built by Skilled Japanese Traditional Craftsman of Hida, Open-Air Bath is located the magnificent view of Hakone. 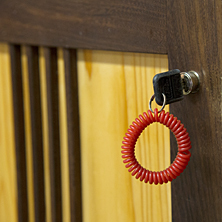 Please experience the warmth of wood by Japanese Professionals.  It has a special edition of the room layout. 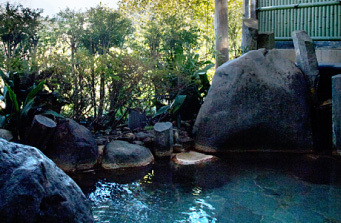 Open-Air bath is facing the mountain side from the deck rooms. The amazing Mountain View from large window at bedroom would meet your satisfaction. 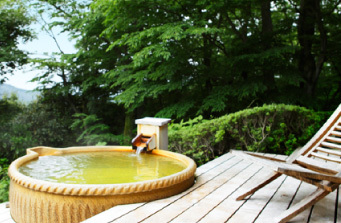 Enjoy the nature of Hakone Season. 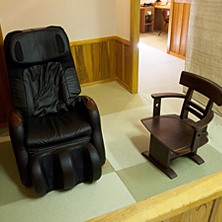 This room is a standard of Gora Hanaougi. We offer you 2 beds of SIMONS with a good-quality furniture with a tasteful design. 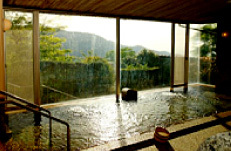 You would enjoy the nature of Hakone Seasons. Terrace of 12 m² is attached to the open-air bath ,spacious rooms of charm. The capacity we have is two people, but the use of the three people is also available. Please inquire directly to us if you wish. Have you ever slept in Futon? 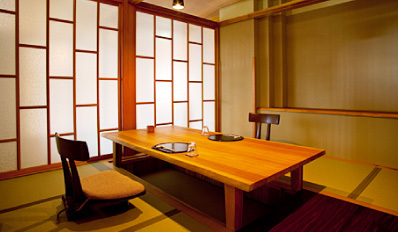 This room has a Japanese Traditional Style Specification. 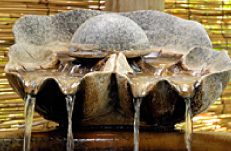 Hope you can enjoy the hot spring water flow and the interesting layout such as TOKONOMA. 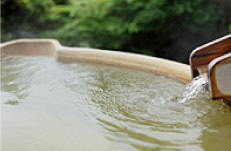 We are using Hot Spring from our original source. It is free to use for our customers only. 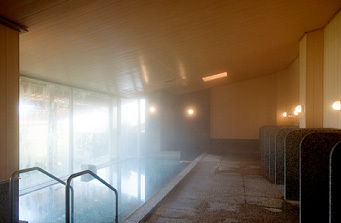 It is spacious public baths that emit the aroma of the forest in Gora. There are 2 kinds of ROTENBURO. One is KAMABURO which is made by wood. The other is made by Granite. The public baths are specious such as blending into the nature. There are 2 kinds of ROTENBURO. One is made by rock. 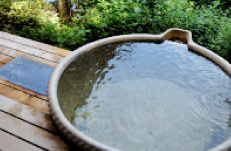 The other is made by SHIGARAKI-YAKI which is one of The Six Old Kilns in Japan. Natural Water and Square Bench. 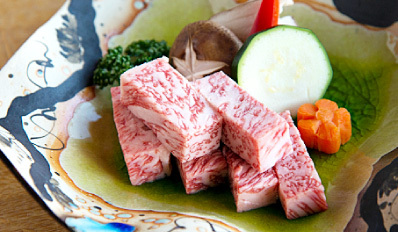 We prepare ingredients that are in season, such as Finest Hida Beef and Fresh Fishes delivered every morning. The dining area is divided for each room. 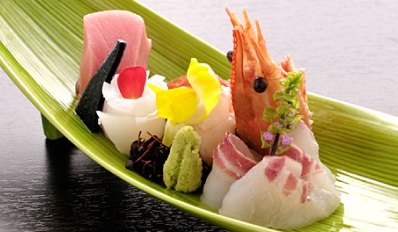 Experience the Japanese Traditional Full Course with the quaint room. We offer fine selected food and abundance of alcohol and drinks. If you have any allergy or food dietary, please let us know at the reservation in advance. It is possible to arrange the meal for only Pesco-Vegetalian. We apologize that we would not be able to offer you any other Vegetarian meals. We prepare the delightful breakfast with our fine selection for your body and soul. 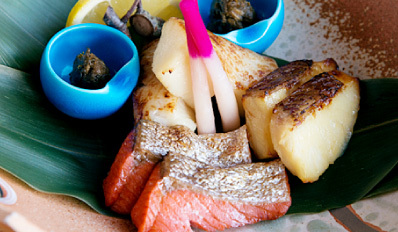 It is Japanese-Style Breakfast such as Rice, Miso Soup, and Grilled Fish….etc.  Hope you would enjoy the finest Japanese breakfast that you can experience at Gora Hanaogui. 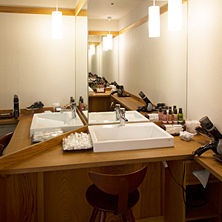 To make your stay more confortable and relax, our check-in time is until 18:00.